Since 1996, NKgalleria lnc. 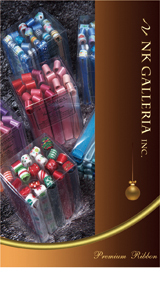 has been specialized in manufacturing and customizing textile ribbons. We understand the importance of developing and design in this continuously changing market trend. Thus, our company offers wide range of products with superior quality and design to satisfy customers' requirements and wants. We value teamwork and professionalism, consistency and quality, rapid and on-time delivery to meet customer demand. In NK Galleria lnc., we value our relationship with our customers and believe customer service and product quality is the key for a long lasting business relationship. With our unique combination of people, excellent quality, innovative technology and competitive pricing will certainly provide a competitive edge to all our customers.